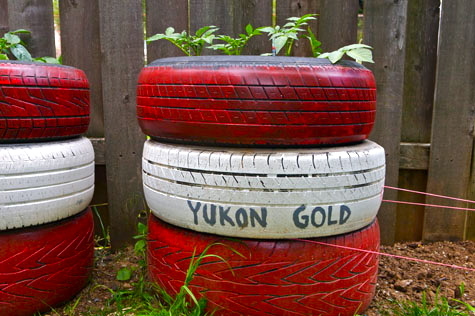 A few years back, I grew potatoes in stacks of tires. It worked out all right for a first attempt, and come fall I had a modest harvest of magnificent taters. This project appealed to me on many levels. Of course, I just love to garden, period. But I also work with a pretty small space, so I get excited by new ways of maximizing surface area. Up not out! Most of all, I really appreciated being able to up-cycle old “trash” into a new, useful purpose. But there was just this one thing. See, tires are made with funky metals. And creepy chemicals. And even though I scoured the internet and couldn’t find anything that would definitively deem this idea as unsafe, well . . . I couldn’t help but be at least a bit concerned. Still, I went for it. And those were seriously, SERIOUSLY, the most delicious potatoes I ever ate. And I was pregnant, and Waits is perfect, so, you know, tires are probably fine. This year I was ready to get my tater on once again. And I wanted to try something different this time. So . . .
We used old some scrap wood instead. Damian built all of the necessary frames in under an hour. Really, it was that easy. He had this plan involving drill holes and dowels and interlocking boxes, but see, we have this toddler. And so we went with expediency. Expediency works good, apparently. Back in early spring we found these taters at the FarMar that Damian was really lovin’ on – some sort of heirloom German variety. So I cut them in half and planted them. Again, so easy! I started with two frames (pictured above) and this time, I was careful to add the dirt very gently, not packing it down at all. I wanted a lot of air in there (you can read the “what worked and what didn’t” from the first potato tire project in this recap). I interspersed layers of compost for maximum plant (and people!) health. 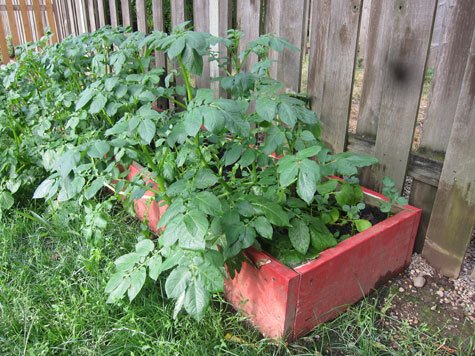 As a control, I also planted a bunch of taters in another raised bed, one that wouldn’t have stacks added to it. This is the bed I asked Damian to build me when I got obsessed with azaleas back around May. 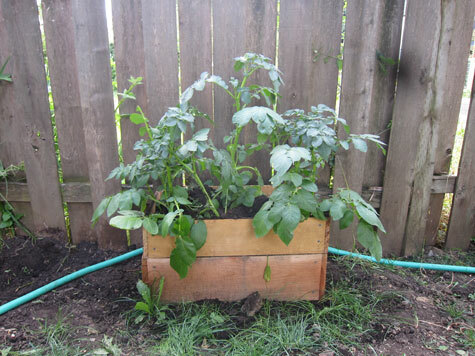 It was supposed to feature artichokes and azaleas, but it’s been completely overrun by potatoes! It will be interesting to see how the yields differ, come harvest. I’ve continued to add frames onto the tower, and now I’m at four which is where I’ll stop. Theoretically, there should be taters developing all the way up the tower, and the tower plants should produce three times as many taters as the single-level plants. I guess we’ll just have to wait and see! Anyone want to make any bets? Do you think the tower taters will make more, or do you think they’ll be about the same? Now, if only I could get Petunia to quit taking dirt baths and laying eggs in my tower! We have chickens too and as my 2-year-old son would say “get out of there chicken” And on the chicken note, mine loves weeds! They would follow us around while we pulled. So my husband put a railroad tie about an inch from the outside of the fence. We then stuff the space between the board and fence with weeds, stand back and watch the chickens go nuts pulling the weeds through the fence. Their pile lasts for days and they love them! I loved your potato tower in their original form but reconsidered recreating your towers for myself when I myself wondered about the raw materials in the used tires. I hope you have a bigger harvest this year! 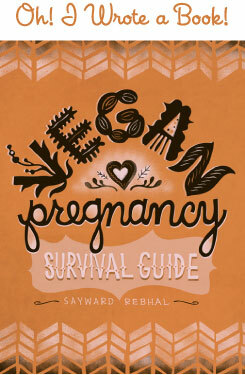 I’m curious… what does a veg*n do with the eggs? And thank you for the marvelous idea we are totally doing potatoes in the garden! What was the scrap wood? Not from a pallet, I guess? Cause pallets are often treated with some pretty aggressive pesticides. Probably at least as bad as whatever might leach from those tires. What an amazing idea, thanks you’ve inspired us. We are just planning our winter crops here-our winter is Mediterranean so quite mild, though who knows these days. We have been talking potato towers all afternoon! My husband has just been in the garage to find some scrap wood. 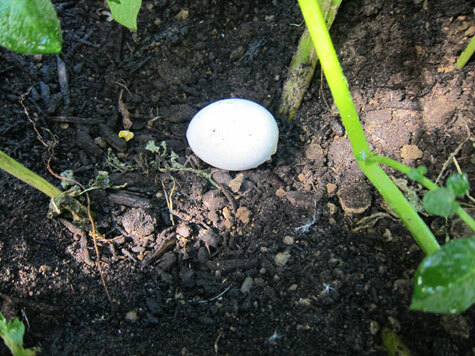 Now to decided on where to put them……..
Ha ha…that’s awesome that your chicken lays eggs in your potato tower! Our little sparrows drove me crazy this spring. They kept taking dirt baths in my carrot patch! Non of my carrots seeds would germinate! I had to cover the area with netting! We tried the tire tower thing too…but I didn’t add any more tires this year because we got them in late. 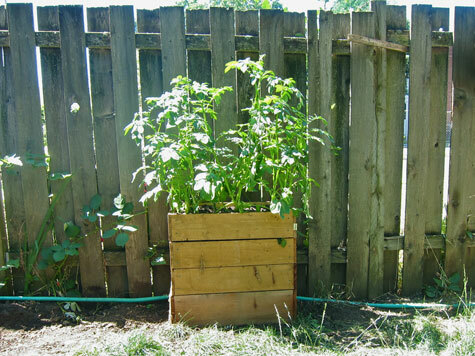 I too am feeling a bit iffy about the rubber in the tires….I like your box idea! Also sometimes I give them to the dogs. No worries, it was just leftover from a building project. Totally garden-safe. Ooh let me know if you do it! I’d love to see other people’s towers!